Puppy Dog Pals is a Disney Junior cartoon series that follows the fun adventures of brothers Bingo and Rolly, two pug puppies. They also have a cat sister named Hissy, and a super cool robot dog named Automatic Doggy Robotic Friend, aka A.R.F. 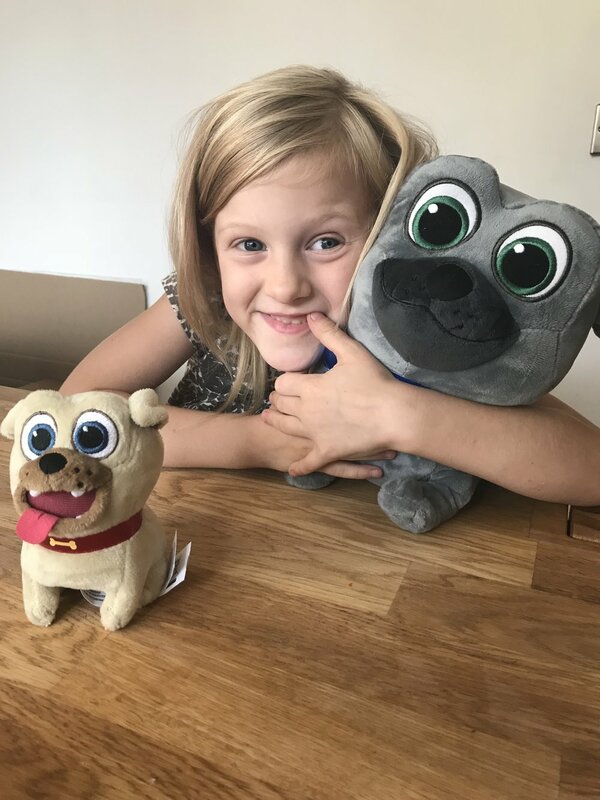 Join me and UKMumsTV Twitter page on the 15th of August 2018 between 1 - 3pm for the #PuppyDogPalsToys Twitter Party where you can win some amazing Puppy Dog Pals prizes from the latest toy range from Flair! This party is to celebrate the brand new Puppy Dog Pals toy range from Flair and we are super excited to be a part of the #PuppyDogPalsToys fun. During the Twitter party, there will be competitions with lots of fun and games to take part in where you can win some great prizes - just don't forget to use the #PuppyDogPalsToys when you do join in. Doghouse Playset - the playhouse also includes Bingo and Rolly figures, along with an A.R.F that Bingo or Rolly can ride as they roll down the slide.. They can also play on the tyre swing, take the lift up and down, play on the see-saw, and so much more..
Pet & Talk Plush Pals - available in Bingo and Rolly, the super soft and cuddly Rolly stands 4" tall and is just the right pocket size. You press his back to activate fun head movement and phrases from the show. Deluxe Friends set - this set is packed full of 10 characters and accessories. Included is Rolly, Bingo, A.R.F, Bob, Keia, Hissy, a cat bed, two bowls and a play toy. Racing Rocket Bingo & Rolly’s Sailboard Launcher - with these you can load Bingo or Rolly and their vehicle into the launcher, press the button with the paw-print and watch them whizz. Puppy Love Plush Bingo - this cute plush is SO soft and cuddly, and super cute. Travel Pets and Figures - each Travel Pet includes a blind pack - these are great little collectables. And for my twitter party guests. Activity games - for us to join in during the Twitter party. Goodie bags - which will include colouring pencils, stickers, poster, bubbles and Disney Jr Awesome colouring book with stickers from Igloo Books. We've had great fun playing with the toys, and loved them all - we're also super excited to be joining in the #PuppyDogPalsToys Twitter party on the 15th of August 2018 between 1 - 3pm - see you there!.